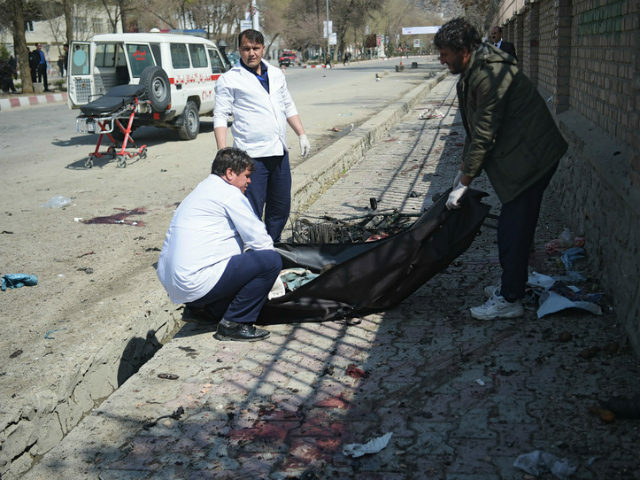 The Islamic State (ISIS/ISIL) claimed responsibility for a heinous attack in the Afghan capital of Kabul Wednesday that killed up to 33 and injured 65 others while they were celebrating the Persian new year. “There was a huge explosion, and I saw a lot of people running away,” Sayed Omer, who was nearby at the time of the explosion Wednesday, told Reuters. The jihadists targeted the Kart-e Sakhi shrine, located near the university in the west part of Kabul. “Nawruz, an ancient Persian celebration of the start of spring, is widely celebrated in many parts of Afghanistan but has also faced opposition from some fundamentalist Muslims, who say it is un-Islamic,” acknowledges Reuters. Taliban jihadists who also operate in Kabul denied any involvement in the attack. The deadly incident comes soon after the top commander of U.S.-NATO troops in the country announced that the coalition has deemed protecting Kabul the “main effort” of its intensified offensive following a series of recent high-profile terrorist assaults at the hands of the Taliban and ISIS. Most of the Shiites in Afghanistan belong to the ethnic Hazara community, targeted by jihadists in the past. Kabul, home to various embassies from around the world, is supposed to be the most secure area in Afghanistan, but in recent months, terrorists have frequently infiltrated the area. The Taliban and its ISIS rivals have been competing for influence in Afghanistan since the latter established a foothold soon after former President Barack Obama declared an end to the U.S. combat mission at the end of December 2014, a move that came with the removal of most American troops from Afghanistan. Since taking office, the Trump administration has intensified military operations in Afghanistan in response to the deteriorating security conditions he inherited from his predecessor, increasing the presence of American combat advisers and airstrikes. The Taliban has expressed a willingness to discuss peace, but only with the United States, not Kabul, believing that America holds the real power. A recent spate of Taliban and ISIS-claimed attacks that reportedly killed nearly 200 people, mainly in and around Kabul over a period of one month. In May 2017, one attack in Kabul alone killed more than 100 people. Although no group claimed responsibility, U.S. and Afghan officials accused the Taliban- and al-Qaeda-linked Haqqani Network. The Pentagon considers the Haqqani Network the most significant threat U.S. troops and their allies face in the Afghanistan region.